Georgia Nelson spent over thirty years in the medical industry and remembers, as a little girl, that she wanted to be a nurse when she grew up. While in this field, she noticed she always got pulled back in to dermatology. When her sister was seventeen years old, she was in a horrible head-on collision that split her face open, leaving her face severely scarred. Georgia shared how this trauma affected both of them. “When you’re a teenager, damaging your face can seem like the end of the world.” Though her sister continued to have surgeries and as a team of doctors worked to diminish the scarring, Georgia noticed a transformation in her sibling that inspired her to help others with their skin problems. She has wondered if this was one of the reasons she found herself working in the dermatology departments throughout her career. Georgia became intimate with her own physical struggles, as she was diagnosed with cervical cancer and then later, basil cell carcinoma. This struggle also made her passion for oncology and hematology grow, as she came out a cancer-survivor! 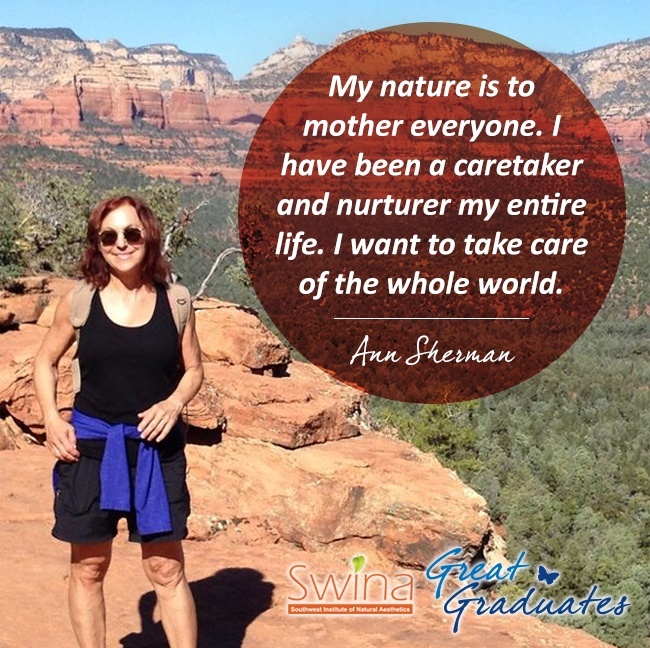 Since graduating from Southwest Institute of Natural Aesthetics’ Advanced Skincare and Cosmetic Laser Program in 2014, Ann has begun a new adventure in her life with her own home day spa, Mindful Skin Spa, which is located in Chandler, Arizona. Ann practices what her friends call “holistic aesthetics”, meaning she uses all-natural, organic, and fragrance-free products, and educates her clients about the health aspects behind their skin. Ayesha looked to SWINA when deciding on a professional career as an aesthetician. After being a stay-at-home mother of 2 for nearly 20 years she desired projects that would continue to make her feel purposeful to others and allow her to continue to care for others resulted in her path to natural aesthetics. Tiesha Lamb is a licensed aesthetician and the owner of Skin Voodoo in Gilbert, AZ. She combined her education in nutrition and aesthetics with her love for helping others feel their best. In fact, one of the most valuable takeaways that Tiesha learned was ”that there is not one solution to every problem. Sometimes you have to search, dig, and research all night to help your client, yet it can be done! These situations arise to make you a more educated and adept aesthetician and a more caring individual.” It is obvious in Tiesha’s online reviews that her clients have experienced this within her services and sessions. 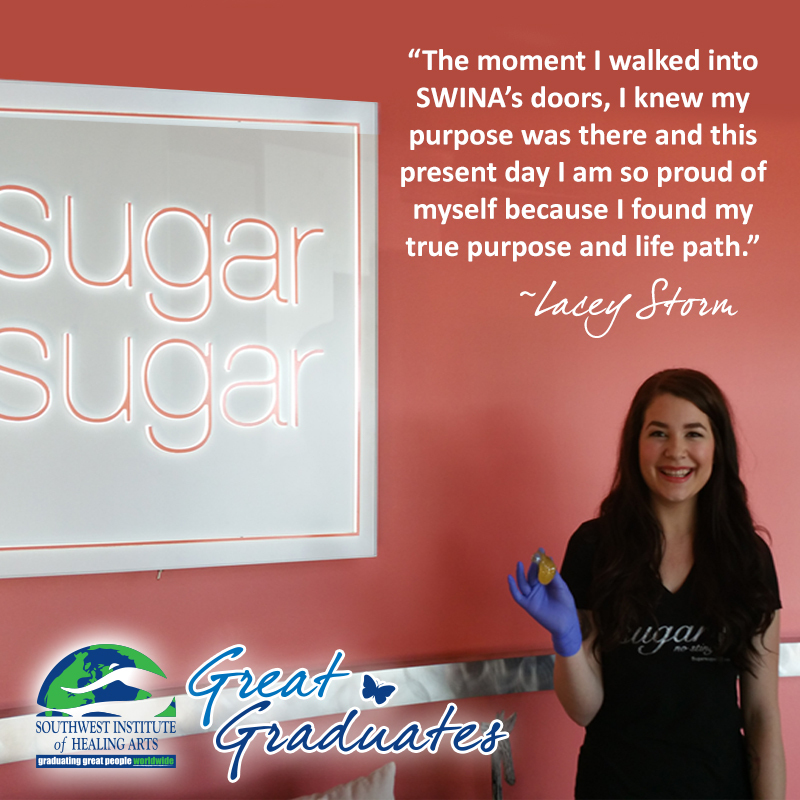 Tarah Hunter & Lacey Storm: Two GreatGraduates, Sweeter than Sugar! The moment you step foot inside Sugar Sugar salon in Scottsdale, AZ, you are in for a sweet treat. One can expect to be greeted by a jovial and genuine staff member – oftentimes the owner herself, Aimee, or one of two graduates from the Southwest Institute of Natural Aesthetics (SWINA), Tarah Hunter or Lacey Storm. 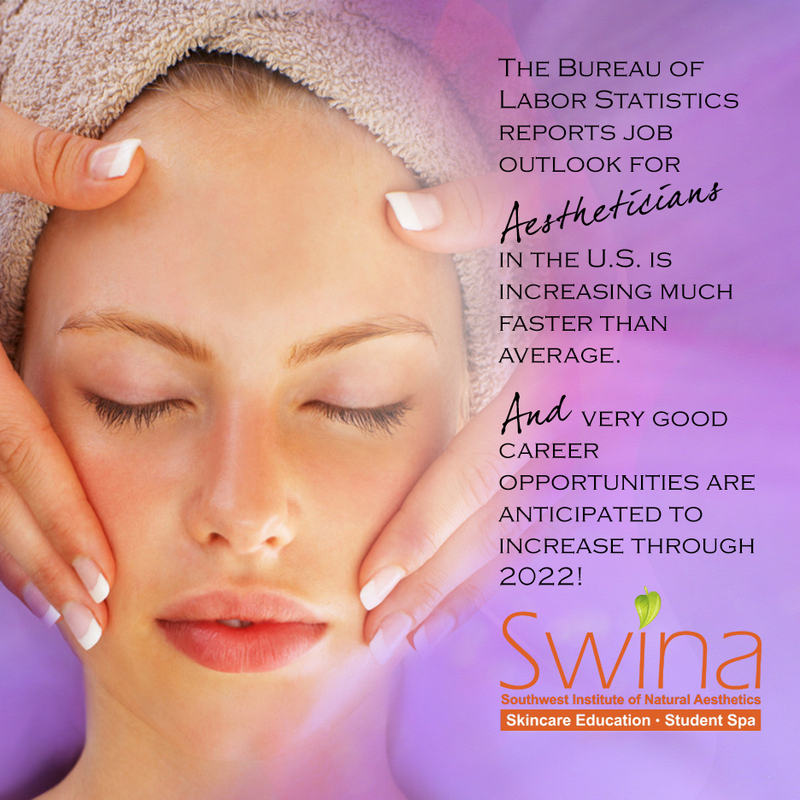 Lacey and Tarah find themselves happily employed as licensed aestheticians for a growing franchise due to their enrollment at SWINA. Linda Binette’s education at Southwest Institute of Natural Aesthetics (SWINA) brought more gifts to her life than she could have ever imagined. From the moment Linda toured the SWINA campus, she was confident it was the school for her. As a branch of Southwest Institute of Healing Arts, she knew that SWINA would provide her with the holistic education she was looking for. 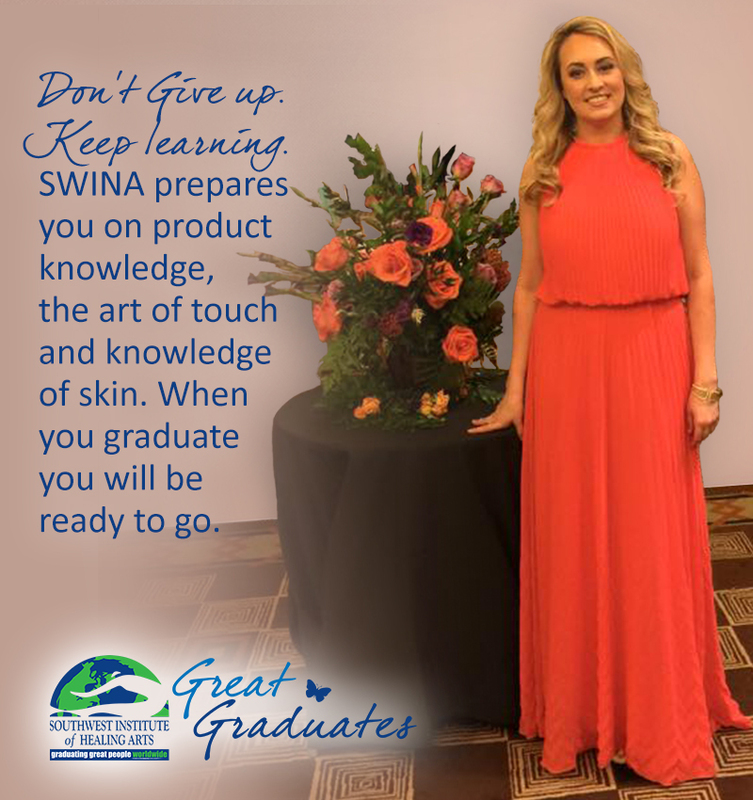 So Linda began her Natural Aesthetics program at SWINA. 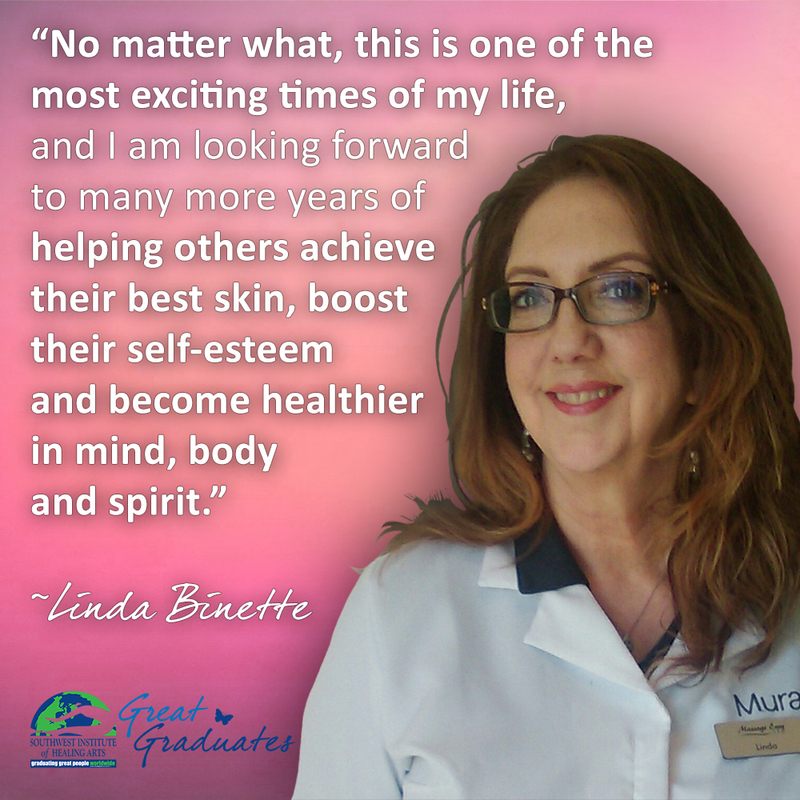 In addition to hands-on aesthetics training, such as skin care, makeup and waxing, spa technologies and even holistic theory and business courses, Linda learned how to be centered and present in all that she does. One of the most important skills she gained was how to really listen to what her clients are saying, or NOT saying. “It is so fulfilling to know that I am in tune with my client’s goals, and that the client trusts me to lead them in the process,” Linda explains. Kiera Stroup always wanted to move to Arizona. 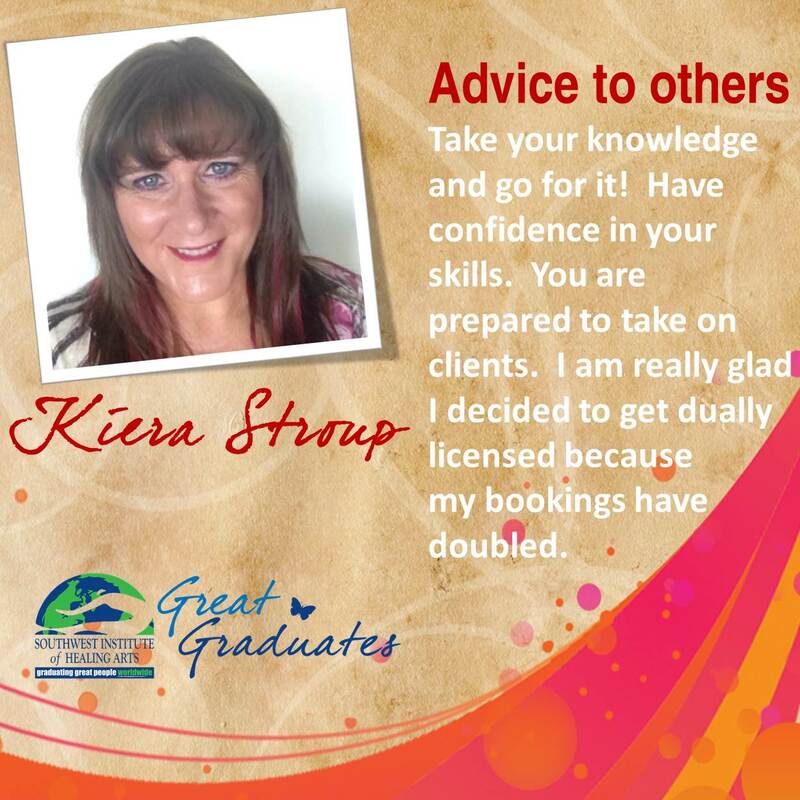 A native New Yorker, Kiera earned her Bachelor’s degree from Manhattan College and then began a corporate I.T. career that lasted 27 years and took her to Connecticut, California, and finally Memphis, Tennessee. It was at the University of Memphis where she earned her MBA. However, Kiera still longed to live in the Grand Canyon State. In 2013, Kiera’s corporate I.T. career came to an unexpected end when the company she worked for eliminated her position. Instead of feeling sorry for herself, Kiera took it as a sign and headed for the Valley of the Sun to fearlessly pursue her dream. Since Kiera had a longtime interest in skincare, she felt that a career change to the field of natural beauty would be a good fit for her. She found Southwest Institute of Healing Arts (SWIHA) and called to inquire about aesthetics programs. Based on Kiera’s other interest in massage, her Admission Coach suggested SWIHA’s 1000-hour Massage program, which would allow her to become dually licensed in massage and aesthetics. This specific program is unique, in that, students have the opportunity to complete part of their program at Southwest Institute of Natural Aesthetics (SWINA), SWIHA’s branch campus where the natural aesthetics programs and courses are held, located two miles south of the main campus in Tempe, Arizona. Great skin is often associated with youth and beauty. Gorgeous models with glowing faces adorn magazine covers. Countless ballads and romance novels wax poetically about the thrill of a lover’s touch on their skin. Keeping our skin healthy and supple is a huge business throughout the world. A 2013 story in the Huffington Post, written by Rebecca Adams, states women in the U.S. spend $426 billion on beauty products alone. This figure does not include beauty and spa treatments such as facials, waxing, deep pore cleaning or microdermabrasion, laser treatments or photo facials. Women in the U.S. spend $426 billion on beauty products alone.